Her spiritual journey began at an early age and over time she developed an authentic relationship with Jesus Christ. Under the tutelage of her Senior Pastor, she accepted her call to minister in 1999. She was licensed to preach in 2000 by the late Reverend Dr. R.W. Wiggins and Senior Pastor Allen T. D. Wiggins. 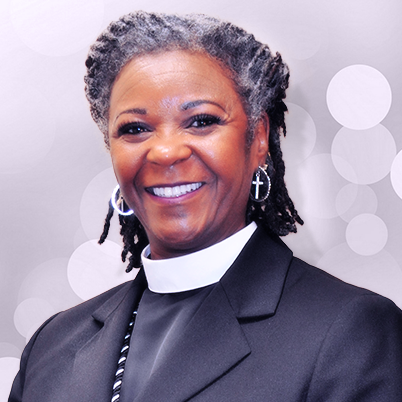 Pastor V was ordained an Elder and most recently appointed Pastor of Christian Education by Archbishop Allen Wiggins in 2019. Pastor V is the daughter of Bro. Eugene Lewis, Sr. and the late Deaconess Ella Lewis. She was born in Greenville, Alabama and raised in Orlando. She is a proud graduate of Jones High School (Orlando); the Way of Life School of Ministry (Orlando), Valencia College (Orlando), and the University of Central Florida (B.A., M.P.A., Public Administration). She currently serves in ministry as the Pastor of Christian Education with oversight of not only Christian Education, but also the Minister’s Ministry, Deacons and Deaconess Ministries, Children & Youth Ministry, and the Social Justice Ministry. Pastor V is Founder & Executive Director of A.W.’S.O.M.E. Ministries International, Inc. (Anointed Women Serving Our Messiah Eternally), a faith-based, community outreach ministry. The scriptures are explicit where it explains that without knowledge God’s people will perish (Hosea 4:6). My vision for Christian Education is that every person (from the “littles” to the most seasoned saint) develop an unquenchable hunger and thirst for learning more about Jesus Christ, growing closer to Jesus Christ, and ultimately living victoriously through Jesus Christ.